Please note that most of the above catalogs are available on a CD that may be obtained from the curator. The link below opens a text file with a list of files on the CD. 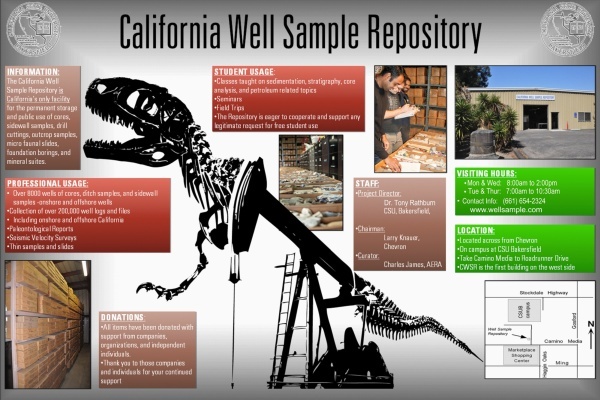 For information on using the California Well Sample Repository, please see our web page on procedures and policies. For information on what is available in our collection, please see our catalog, which provides links for downloading files that list our available core, cuttings, well files, reports, and paleontogy samples. Our publications are also available for download. Please note that the Well Sample Repository is not liable for any errors in these files, or for any interpretations resulting from use of this Electronic Catalog. Our catalog files are in Microsoft Excel (.XLS) format, which can be read by most spreadsheet programs. These files print in landscape format with legal-size paper. Our publications are in Adobe Acrobat (.PDF) format. A free Adobe Acrobat reader is available for download by clicking on the Adobe icon below.